Maybe you're brand new to direct sales and have never sponsored another person into your business. Maybe you're a seasoned representative who's hit a sponsoring "dry spell." Or maybe you've just never really gotten the hang of this whole sponsoring deal. Regardless, if you're serious about working your direct sales business as a "real" business, building a thriving team is the key to success. Here are my top 6 tips for becoming a better recruiter. If you realize that you are one of the greatest things to come along since the invention of M&Ms or chocolate covered raisins, and you have an amazing direct sales business opportunity to offer someone, your perception changes. Get grounded in what makes you and your direct sales company special, unique, and great. And then fall in love with your company and your product and share that passion with others. This really is the key to sponsoring, in my opinion. The easiest way to get over your fear of recruiting is to remove the confusion and common misperceptions surrounding it. As a direct sales trainer I recommend that you talk to your leader or a coach about what you are doing right and wrong and get some specific ideas about what you might change. Whether you are an introvert or an extrovert, recruiting can actually be fun. You get to meet a lot of neat people, continually have new experiences, and learn more from every interaction. Enjoy this process, consider it part of your direct sales training and fear will be the last thing on your mind. The more creative you are in your recruiting efforts, the more fruit your efforts will reap. Put your own unique, creative twist on it. For instance, be sure you have a compelling, visual recruiting “commercial” to share at every show you do (like a "why" bag with props that shares what you love about your direct sales business and what it's provided for you). So you've tried several ideas (things you've learned from others and things you've come up with on your own) and have yet to see the rewards to your efforts? That doesn’t mean they don’t work! A few people haven't returned your calls or acted to join your business? That doesn't mean they're not interested! It just might not be the best time for them. Be persistent and keep putting effort into your recruiting strategies and, most importantly, continue to follow up with potential leads. With continuing persistence, the results will happen. Finally, great results do not happen by accident. They are the byproduct of a well thought-out, documented, logical plan. Design a daily, weekly, and monthly plan for your business. Work with a coach or your leader to design and follow your plan. So, there are 6 of my best ideas. What about you? What have you done that's worked well for you in this area? 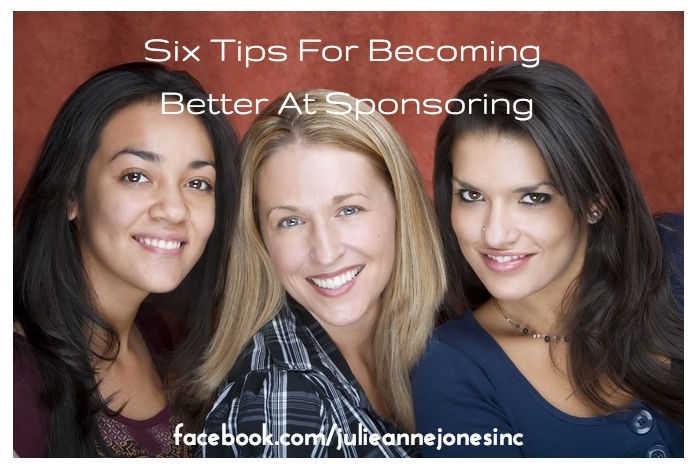 I'd love to know what your most successful sponsoring strategies are.